We received the following message from Steve Shewe, a member of St John's Episcopal who helped spearhead the event to aid Syrian refugees, which took place on Sunday January 3.Through the Board of Christian Outreach, LHUCC contributed to the concert contributing $100.00 towards event expenses and assisting with publicity. My heart is full this morning, and my ears are ringing with the splendid music we enjoyed Sunday, and the beautiful sense of community that I saw around me. Many thanks to all of you and to your religious assemblies for bringing relief to displaced people inside Syria. I hope many of you were able to attend. As I write, American Refugee Committee has received $75,000 in donations and ticket sales from the concert, and envelopes are still coming in. 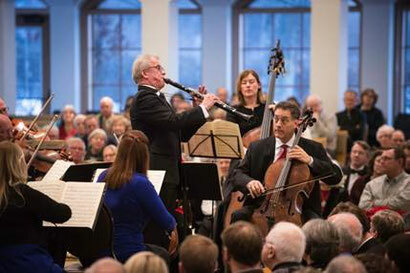 Over 900 people listened to fabulous classical music. One of the most beautiful sounds I heard was of people clapping between movements of the Mozart and the Tchaikovsky, because that means we reached a lot of people who don’t often get to Orchestra Hall! Savor the moment with your congregants!